Thankful Thursss…oh wait, it’s Tuesday. We’re over a week into November, and Thanksgiving is just around the corner. Some of the other blogs I read (Run Away With Me and Darlin’ Rae) have been posting about what they’re thankful for in order to get in the mood, and since I’m a copy cat I’m going to do the same. At least with this single post. 1. My Job – I haven’t written about this on the blog, but long story short: I left my job as a mechanical engineer in January. I then spent the majority of the year studying for the first couple actuarial exams and trying to find my way into a new field. Last Monday was my first day in my first actuarial job! I’m so thankful everything came together and this is working out. 2. Trip to Buffalo – Jeff and I are spending Thanksgiving in Buffalo this year. I can’t wait to spend some quality time with my family and friends, especially my just-about-6 month old niece who I haven’t seen since July! We’re also running the Buffalo Turkey Trot which I have run 6 times now. 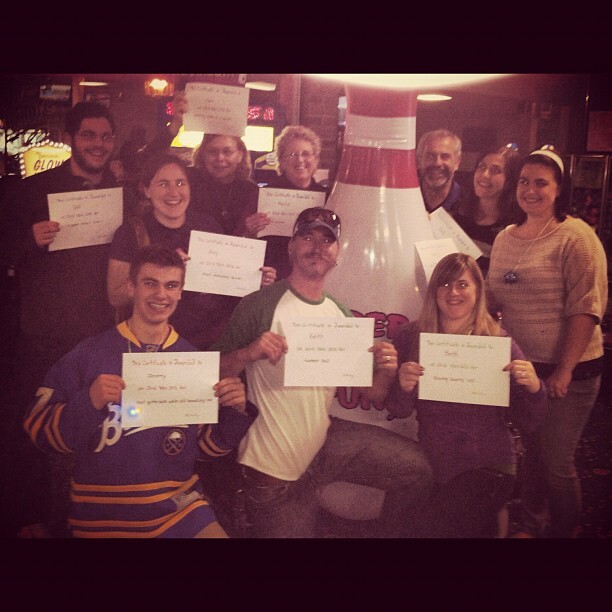 My extended family likes to go bowling after thanksgiving (and christmas). We also have things like trophies and certificates. 3. That I like to Run – Not just that I can run, but that I like it and I figured that out. If I hadn’t given it a chance and stuck with it for as long as I have, I might never have known how much fun it is. It’s so great to be out running on a sunny Saturday morning in the fall, but so many people don’t get to, or even want to. 4. Friends & family – I have some great family and friends. Whether it’s the big things like supporting me during a career change, or just sending me a funny text in the middle of the day. They’re great. I’m counting you, my blogging buddies, in this one, too. 5. Chapstick – I’m a tad overly interested in chapstick these days. I rotate flavors and look forward to the days when I have my favorites. Which are: Burt’s Bees Coconut Lime, Grapefruit, and Vanilla Bean, and Badger Balm Lavendar & Orange. It may sound like I have a problem, but I bet I won’t be having any issues with dry lips this winter. 6. My smartphone – My new work has a very strict internet policy and I can’t use my work computer to check my personal email – even during lunch break – so I’m extremely thankful to have a phone with a data plan that I can use for this purpose. I also get to read and comment on my favorite blogs while eating. 7. Streaming video – I’m talking Amazon Prime and Hulu. Who doesn’t love a good TV series binge? Now that it’s getting colder out, I’m really looking forward to curling up on the couch with my computer and multiple seasons of a show. (Well, to be honest, I do this year round). 8. A Comfy Bed – Getting into a nice soft bed with clean sheets is so nice. Sometimes it’s the little things. 9. Books – I have a HUGE stack of books I’m reading. There are just so many great ones out there! And, now that I have a long commute, I’ll be listening to audio versions, too. Any of the same things as me? 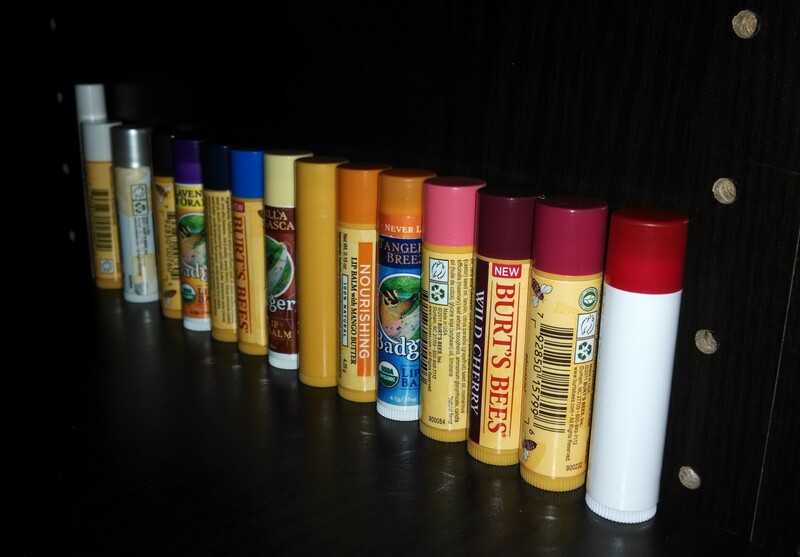 Ever go overboard on the chapstick? ← So, I ran my fall marathon…now what? I really like all the things you’re thankful for! They seem simple, but they are the things that make life happy. We share a lot of the same ones, esp comfy bed LOL and I really love Hulu 🙂 PS I think that’s really cool that you’re an actuary. My dad keeps telling me I should do that. Yes, it really is the little things! As far as being an actuary, it’s only been two weeks, but so far so good! Nice! I’m also thankful for my comfy bed. Ben and I bought a brand new bed 2 years ago and it’s been so amazing. Yeah, it makes a big difference. Oh, and when you have fresh just cleaned sheets…the best!